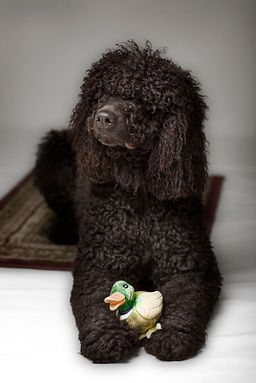 So you’re considering an Irish Water Spaniel and you’ve checked out the pages here on the site.You’ve learned about the history of the breed, the breed standard – and even how to groom one. But you still have more questions than answers. This page will try to answer some of them for you. 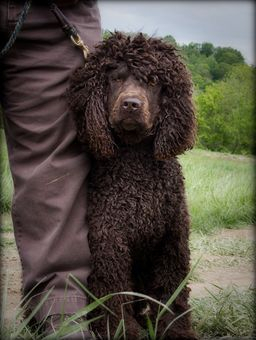 How can I meet an Irish Water Spaniel in person? Contact one of our breeders listed here to see if there are any owners in your region. Ask the breeders if there are any dog shows coming to your area where some of them will be showing. Any other resources for getting to know an IWS? You Tube videos featuring the IWS. A wonderful blog about daily life with two IWS. Become our Facebook friend to meet some other owners and see our gallery of photos. Can you describe the behavior, compared to other dogs? Our loveable breed has an array of personalities and much is determined by the environment you create for your dog. As with any dog, exercise, socialization and an educated, sensitive owner are the keys to good canine behavior. The cost of buying any dog varies so check with the individual breeders. Keep in mind that the cost of responsible dog ownership is not inexpensive. Click here for an AKC article about the expenses any dog owner will likely incur each year. Additionally, some of our breeders will expect you to test your dog in accordance with our CHIC protocol, which helps our breeders maintain their healthy pedigrees. Ask the breeder for more information. Are IWS good “people dogs”? 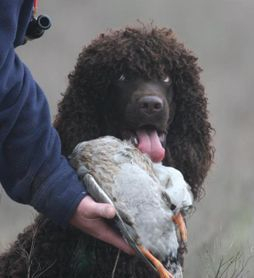 IWS were bred to be personal hunters so their natural tendency is to be very loyal to their people. This means that while they tend be polite with visitors, they don't really care if they get adored by strangers right away. They may take awhile to warm up to visitors but, because of their intelligence and sensitivity, once a friend always a friend to an Irish Water Spaniel. What about shedding and are they hypo-allergenic? Shedding is usually minimal and it is different from most dogs. If anything you will find fuzzy “dust bunnies” in the corner, rather than dog hair on your jacket. 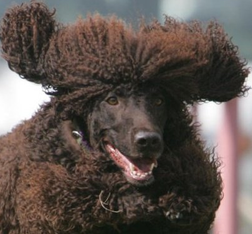 While a “hypoallergenic dog” is something of a myth because allergies are so personal, the IWS is considered on par with the Poodle. Do I want a male or a female – how do they differ? The IWS have superior intelligence but it is an intelligence that is mischievous. An IWS should be “trained” at all times - even if it just stupid pet tricks. If you don't engage their minds in something that is tolerable, they will find their own ways to use their intelligence - and it won’t always be as fun for you as it was for them!They love games –especially when played with their family members. If you play the game of Obedience, they will learn. If you play the game of Agility, they will learn. But be prepared to see their own spin on the rules. If you play the game of “putting toys away” they might decide toilets are a good receptacle for tennis balls, stuffed toys, and furniture. Within the breed it is called “the streak of the Irish.” They are playful and clownish and they seem to delight in their own sense of humor. What if I work all day and no one is home? Because of the combination of devotion to owner, keen, sense of humor, great intelligence and need for significant exercise, the IWS would not be the best dog for a person who is not home all day. Lonely, bored and frustrated does not bode well for a dog with this level of intelligence. Other breeds would promise a better outcome. I talked to a breeder but they wouldn’t let me pick out my pup. That seems weird. That breeder is doing you and your family the biggest favor imaginable. Only an experienced breeder can predict a grown dog’s personality from the hints and quirks of a puppy. If you are open and honest about your expectations and the environment you will share with your dog our IWSCA breeders will select a puppy that custom fits your needs. A trusting and open relationship with your pup’s breeder is the best way to optimize a positive outcome. If these dogs are so great why are they so rare? The breeders of the IWS are more devoted to the wellbeing of the breed than they are interested in making money from their work. For the most part they breed carefully and rarely, mindful of the breed’s history, with their eye on the future health of the small gene pool, and with their heart firmly connected to each pup in every litter they nurture. Because of their vigilance there are no IWS in puppy mills or pet shops and they can’t be “ordered off the internet.” So determined are these breeders, they will guarantee to be responsible for every pup they sell – for the entirety of the dog’s life. The IWS is rare but even more rare are breeders with this level of commitment.